Wladyslawa Tobolska was born in Kazmierz-Biskupi, Poland, the daughter of Wojciech and Katherine Jachnek Tobolski. She immigrated to the United States aboard the Vaderland, arriving at New York from Antwerp in May 1906. Quickly settling in Chicago to live with her older sister and her family, Wladyslawa later married Stanislaus Piotrowski in April 1915 in Gary, Indiana. Yet when Wladyslawa first came to the United States, she was only 8 years old. I think of my daughter, approximately the same age now as Wladyslawa was then, and I am simply amazed. The fear and excitement that must have gripped her during the trans-Atlantic journey! Wladyslawa Tobolska, arr. New York, 29 May 1906, Vaderland, p. 100. At first glance, Wladyslawa appears to be part of the Barizinska family, but we can see Tobolska written in a smaller font and at a slight upward diagonal, suggesting the surname was written in later at some point. The “Admitted” stamp on the left indicates that Wladyslawa and her traveling companions can be found in the Likely Public Charge pages at the end of the Vaderland‘s manifest. Marian Smith’s outstanding “Manifest Markings” articles provide additional information on this fascinating sub-story of the immigration phenomenon. The family story, as told by my father, is indeed supported by the evidence. Being so young and unable to provide for herself, Wladyslawa was indeed detained by Ellis Island officials. Claimed by someone, perhaps her brother as the family tradition suggests, Wladyslawa reappears in the 1910 Census, living with her sister and her family in Chicago. My father does not recognize the Barizinska name, nor has it come up elsewhere in my research. Here is an image from the “Record of Aliens Held for Special Inquiry” at the end of the Vaderland manifest. Wladislawa Tobolska, arr. New York, 29 May 1906, Vaderland, p. 139. That being said, there appears to be a family connection, as the “cous” mark shows next to Josefa’s entry. Perhaps Josepha (and Fanina) are cousins and traveled with Wladyslawa to ensure her safety in the long voyage across the Atlantic. Regardless, I have some new names and avenues to explore, both in the United States and in Poland. One of my favorite subjects in family history is immigration and passenger list research. Not only the compelling personal stories of our ancestors as they leave one life behind to begin another, but also the infinite array of research possibilities: the ports of arrival, the ships and vessels themselves, the genealogical value and evolution of the records, and of course, the various spelling permutations of our ancestor’s surnames. Many researchers are understandably focused on the manifests themselves as they begin their immigration research, yet by doing so, they overlook a potential key source of information. 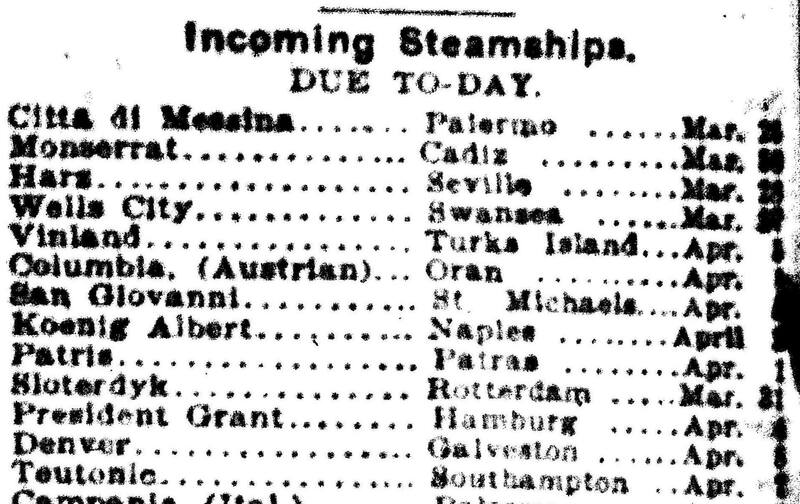 Many port city newspapers maintained a shipping column in their pages, a daily list identifying what ships are coming, going, or expected to arrive in the next day or two. This Shipping & Mails column is particularly helpful in verifying the date of arrival of an ancestor’s ship, much like the Morton Allan Directory, but can also provide unique one-of-a-kind information detailing a ship’s arrival. “Incoming Steamships,” New York Times, 15 April 1909, p. 16, col. 7. It’s a bit smudged, but the article above also shows that the President Grant departed Hamburg on April 4, thus making the trans-Atlantic voyage in 11-12 days. Further down the column, additional information on the President Grant‘s arrival at Ellis Island can be found. “Reported by Wireless,” New York Times, 15 April 1909, p. 16, col. 7. An extension of the New Jersey coastline, Sandy Hook is just south of the entrance to New York’s harbor, meaning that the President Grant was still more than 300 miles out to sea the day before arriving at Ellis Island. More importantly, because of this newspaper article, I now have the approximate hour (2 p.m.) when my immigrant ancestor first set foot in the United States. What a find! The manifest itself reveals information on Stanley’s life, occupation, birthplace, who paid his passage, final destination, and much more, but this Times article sheds a whole different light on his arrival at Ellis Island, offering a level of detail not found in any other source, save perhaps a personal diary or family oral tradition. We all strive to make those personal connections with our research, linking the past both to the present and future. Like the example here, perhaps the local newspaper can make those connections for you and your immigrant ancestor.